Steal (Borrow) It From the Runway! The runway is meant to inspire. You and I aren’t likely to get our hands on the latest Carolina Herrera collection, but we can borrow colors, silhouettes, and themes. Why not get inspired by top designers, and take a stroll down your own runway? Love the animals. 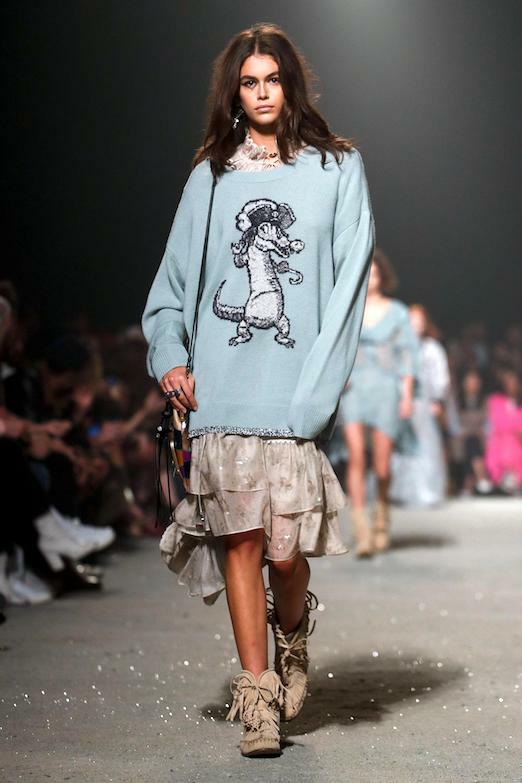 This Coach sweater is too cool for school, featuring Tick-Tock the stylish crocodile from Peter Pan. I love a fun and funky top, especially with animals, whether cuddly pets or scary octopi. You can find a wearable, adorable dinosaur sweater here, for under $50. Color and shape. This fabulous colorful and fringed skirt is from Oscar de la Renta’s collection. It’s even more gorgeous with the floaty orange sweater. I would so wear this exact outfit if I had many extra thousands of dollars. This skirt from Anthro is charming, and fringed, and affordable. Thrifting is another smart source for unusual pieces like this, especially vintage 80’s and 90’s treasures. Whimsical touches. 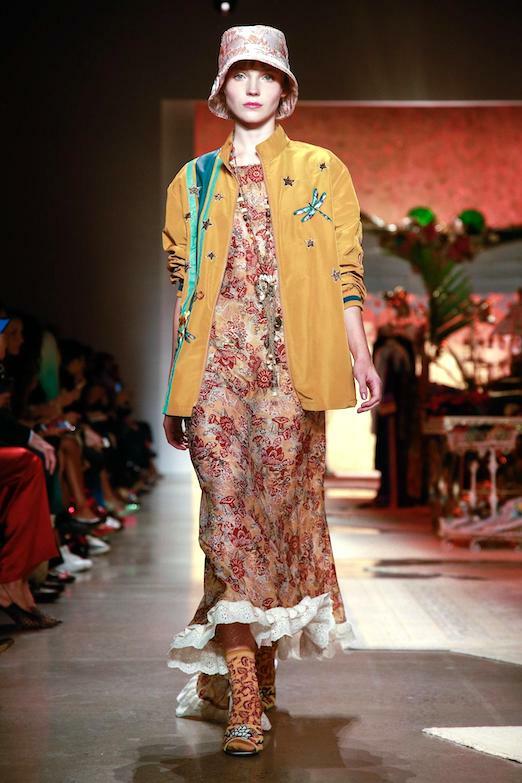 This embroidered jacket, from Anna Sui’s collection, is dreamy. An oversized cut but with dainty details. You’ll find many similars at eBay; this one is particularly fabulous at a small price. Big checks. No bad puns about checks (“check them out”, etc)! But they are trending hard for Fall and Spring. These de la Renta wrap trousers are amazing, not to mention the luxurious coat. Perfect for a Manhattan rooftop party. You can pick up some checks for a lot less, like these sassy trousers (under $100) or this retro lavender check pencil skirt (under $50). Love the black and white outfit, and I would definitely wear the crocodile sweater! I absolutely adore the Tick Tock Coach outfit—-all the way down to those compy nod to Pocahontas moccasins. Perfection.